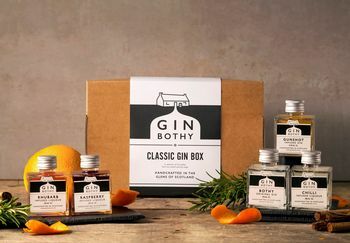 A pre packaged gift box including Bothy Original Gin, Gunshot Gin, Raspberry Liqueur Gin, Rhubarb Liqueur Gin and Chilli Liqueur Gin. It's the Gin Bothy favourites - can't decide which flavour to choose, or want to buy the perfect present for someone?Our Gunshot Gin wins awards wherever it goes, 3 gold star Great Taste 2016 winner, Product of the year at Scotland Trade Fair amoungst others. A perfect neat sipping gin for a cold day, or ideal in a refreshing summer cocktail. For a classic Gin & Tonic use our Bothy original Gin which is vegan and sugar free. Whilst all flavoured gins are made only using the fresh fruit named, our distilled gin spirit and a wee bit of sugar, they are full of flavour, without the additives! 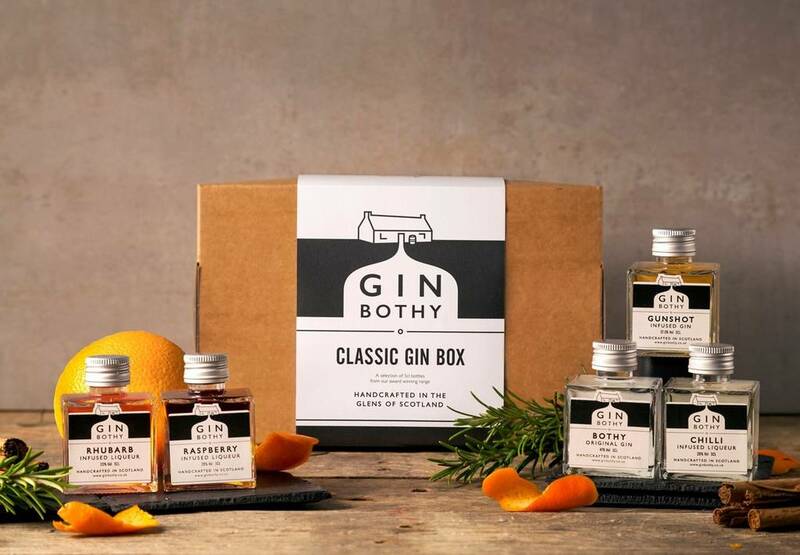 The Gin Bothy Classic Tasting Box includes five mini bottles of 5cl each in the flavours of; 3 gold star winner Gunshot Gin 37.5% ABV, Bothy Original Gin 41% ABV, Rhubarb 20% ABV, Raspberry 20% ABV, and Chilli 20% ABV. Bothy Original Gin recipe incorporating fresh botanicals of Scots Pine, Heather, Milk Thistle, Rosemary and Marshmallow Root. Gin Bothy Gunshot Gin is a distilled gin spirit, with our special spice mix ingredients and sugar create this 37.5% ABV gin. Fruit gins are made from fresh fruit and sugar, our chilli gin is made from a chilli infused syrup. Have you tried our other Tasting boxes - why not take a look at the Love Box, it's a perfect gift!